The Minion's Bible (or Book of Armaments as we call it) is Gerry Roach's guide: Flatiron Classics. This book is currently out of print and it surprises me how many climbers have never even heard of it. 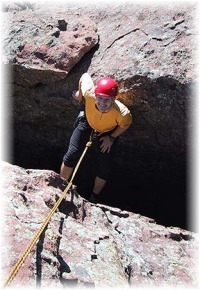 The guide lists hundreds of routes up to 5.8, which is the upper level considered. 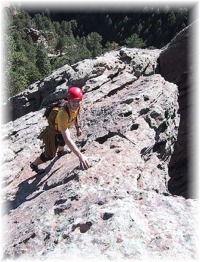 The book is more about exploring the rock wilderness of the Flatirons than challenging yourself technically. 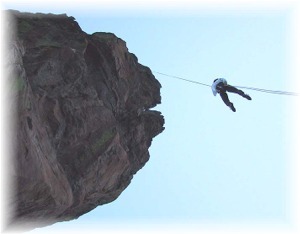 Many of the climbs can be comfortably done without a rope. More recently, the latest goal among the Minions was to climb all of Gerry Roach's *Top Ten* classics in a single day. Buzz Burrell first accomplished this feat (solo, around 1990) with a time of 15 hours and 15 minutes. Buzz is probably most well known as an ultra-runner, and holds the current record on the 480 mile Colorado Trail. The next route is Stairway to Heaven, which lies a good distance south of us. 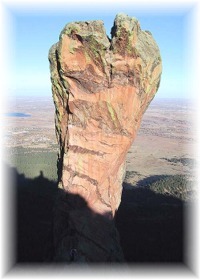 If we bushwhack south from Royal Arch, we know that we can run into the top of it (Heaven). This is one of the trickiest route finding sections, but John does a great job locating Heaven. Here our strategy is somewhat bizarre – we decide to down climb Stairway to Heaven. The reason for this is that we are at the top of the route. Fortunately this is one of the easier routes and John did it a few weeks ago so knows the tricky spots. Following John's lead, we work our way down the stairway. It's easy, but it seems we move more slowly than going up. I guess instead of climbing a stairway to Heaven, we are descending a stairway to … well, better not think about that. We're descending a stairway to Skunk Canyon. In the middle, I take time out to visit the summit of Like Heaven, a spectacular intermediate pinnacle, but John has already been there and scouts down ahead. In retrospect this may not be much faster then descending, going up, and descending again, but it saves a lot of effort. The next two approaches each take over an hour, and here the length of our enterprise is really starting to wear on us. The climb out of Bear Canyon is much more noticeable than usual. Eventually we reach the base of Pallaea. Here we see the only other climbers we are to encounter the entire trip – off to the right climbing difficult sport routes. John isn't exactly sure where Pallaea starts. We find an easy spot, then I rope up, traverse left and follow a ridge upward. This climb isn't too hard except for a headwall near the start, and we simul-climb it as one pitch. Another quick rap and we grab our stashed packs and hike over to Bluebell Creek. At this point I am beginning to seriously question if we can make it. We have been going for over 8 hours, it is 1:45 and I am out of water. My legs are starting to cramp up if I stop for long. This time of year the sun sets around 5, so we have only 4 hours left to do 3 routes with a lot of hiking between them. Bluebell Creek is only a tiny trickle. I finally find a pool just below the trail that is a half-inch deep. By laying one water bottle in the pool, I transfer a cup at a time to another water bottle. In the middle of this two people on horseback come along the trail. I don't want to move, and the first horse is towering over me. Great, it's going to pee in the creek, I think. Is it safe to drink water contaminated by horse pee, if lots of iodine is added? Fortunately, both horses hold their bladders (and bowels), but who's to say the last horse to pass this way did not? We get 2 liters of cloudy water and add 2 iodine tablets each. Soon we are plodding up to the base of the Flatiron. We rope up and simul-climb the first section. It is smooth near the start with not much pro, but higher up becomes easier. When John is at the crux, I find myself trying to hang onto a good jug at all times. I did this on Pallaea as well. But John is solid. We reach the base of the last climb, the North Face of the Matron, at 5:30, almost exactly 12 hours after starting this adventure. At this point it is almost completely dark. I fit my headlamp to my helmet and start up. 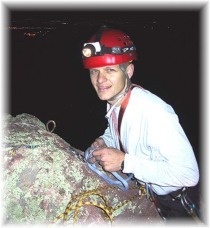 This is actually quite a good climb to do in the dark, because, unlike many Flatiron routes there is a lot of pro. I take my time and place lots of gear, there is no need to rush now that it is dark. At the belay, the wind comes up and I'm getting cold. The lights of Boulder are visible out on the plains. Soon John joins me and I continue up the East Ridge – much easier but with less pro. I can't quite make the summit and set up another belay. John finishes the next short pitch to the summit.